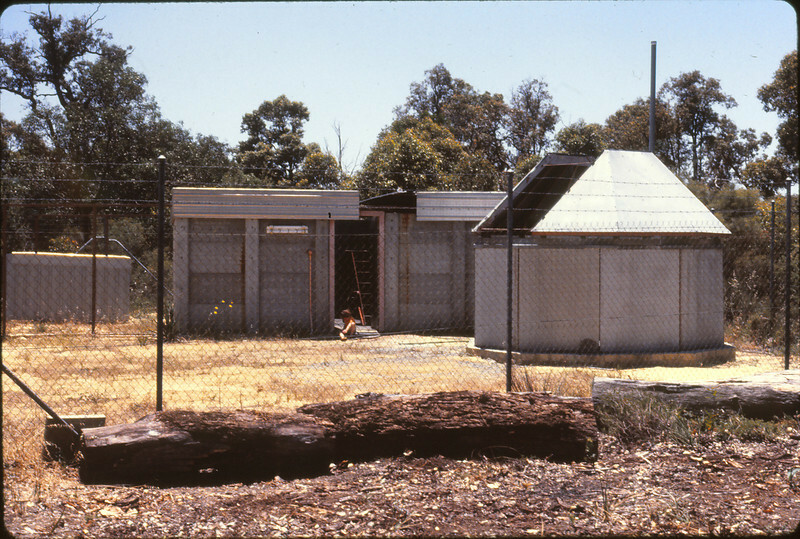 Astronomical Society of WA (ASWA) Observatory 25/11/1979, NE side of Elizabeth St and Poet's Lane, Kalamunda. Kodak Ektachrome 400 Tranparency, Olympus OM10 35mm SLR, 50mm f/1.4 Lens 1/500sec at f/2.8. Scanned using Canon MP980 MFP 19/04/2009. I joined ASWA in the early part of 1977 after going to a public observing night at this location. Meetings were held monthly in the Physics building at UWA at that time where presentations by members and external speakers were arranged. Observing nights were also held at the Kalamunda observatory and after a period of training and proving one's competence, solo use of the telescope was permitted. (The "dome" pictured was not in use). The telescope was a 12.5" Calver circa 1910 on loan from the Perth Observatory and was on a cast iron and brass equatorial mount with electric sidereal motor drive. This was considerably larger and more capable than my own limited manually operated gear and so became the basis for my first attempts at longer duration astrophotography. As it turned out however, the age of the mount and drive meant that periodic error in the tracking required constant adjustment via a guide scope which was quite difficult to achieve and I never produced any satisfactory results with it.